Living in the era of the smartphone means that I’m never without a camera to capture all of life’s special moments. It also means that I never, ever think to print photos, at least not until the day before a holiday and I remember that I really wanted to send a framed photo of my son to his grandparents, or that I wanted a few more pictures on the walls before family arrives for a visit. Crap. This is why, for several days last week, I found myself at Marshall’s, seeking out picture frames for a gallery wall that we were finally going to finish, after moving to our new house over a year ago. (Can you really call it new when you’ve lived in a place more than a year?) And of course, along with all of those reasonably-priced frames, I found myself with yet another beauty haul. I rarely think about Marshall’s for beauty products. It’s where I buy all of my yoga clothes and sports bras, and it’s where I escape to on the weekend if I just need a few hours by myself to browse through racks of cute blouses or fun coffee mugs or baskets or throw pillows … You get the idea. But the makeup section always looks terrible: picked over, covered in broken product, boxes torn and smashed, and if you happen to find the one high-end gem that made its way to Marshall’s shelves it’s usually so dusty or disheveled you’d rather just let it lie. What I realized with my cart full of frames, however, was that Marshall’s has an amazing selection of drugstore and high-end skin and hair care products. I’m sure most of you are already aware of this, but somehow I’d just never dug through those shelves the same way I did the racks of yoga pants. Since I’ve been on a skin care kick recently, I picked up a few items, which led to a few more, and before I knew it, I had a cart full of fun new products to play around with. Check expiration dates, and always test on your inner arm (or other delicate skin) first. I do this every time I’m trying a new product–the last thing you want is to slather on a mask only to find you’re allergic or sensitive to an ingredient. This is especially important for anti-aging products, since the ingredients often exfoliate and encourage cell turnover. Also, Marshall’s sometimes carries products that have been discontinued, so if you find you like something and want to have backups, go back and purchase it as soon as possible while it’s still available, since their stock turns over so often. I could not find links online for some of the products I mention in this post. Marshall’s had a huge stock of them, but they are either discontinued or just not readily available. I am still writing about them, however, so that if you go to Marshall’s, you know what to look for. And possibly what to avoid. So on to the haul and mini reviews. If you just want to see a short list of the top products, scroll to the end of this post. If you want to read more details about how I used it item and whether or not it might work for you, keep reading! 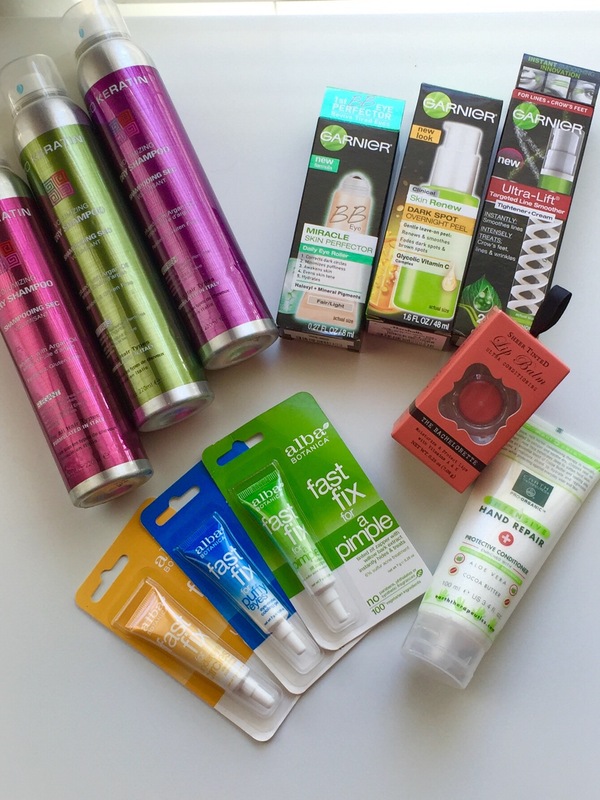 First, I picked up three Garnier products. I love Garnier’s skincare line. I swear by their Ultra-Lift Miracle Sleeping Night Cream and their Clearly Brighter Anti-Puff Eye Roller. So I was excited to try a few more. I think two of the products–the Garnier BB Eye Roller and Garnier Leave-On Overnight Peel–have been discontinued or repackaged, but you can still find them for a good price on amazon.com. The eye roller is amazing. So amazing that I went back the next day and bought a backup. It provides light to medium coverage, so it won’t replace my usual concealer, but what I love about it is that it blends so beautifully into my skin that it looks like I’m wearing nothing, yet my under-eye area is brighter, smoother, and lightly concealed. It is perfect for days when I’m wearing no makeup, no foundation, or even just a light BB cream. Every other concealer I own looks great with makeup, but on bare skin looks somewhat flat and unnatural. This eye roller looks like a slightly improved version of my skin. If you have a lot of under-eye darkness you may not love this product, but if you don’t have really dark circles and you just want some added brightness and a little coverage, this will be perfect for you. You can find it on amazon, or you can find a similar product, the Clearly Brighter Anti-Dark Circle Eye Roller, at most drugstores. Next, I picked up the Garnier Overnight Leave-On Peel. At first, this one confused me. I grabbed it because I do have very prominent sun spots on both cheeks (I like to think of it as nature’s contouring) but then I began to question how to use it. Is it supposed to peel off, or is it a peel in the sense that it encourages cell turnover and thus “peels off” dead skin cells to lighten dark spots? Do I use it alone or put moisturizer on top? After doing a bit of research, it seems like you put it on under moisturizer and it does not actually peel off, like a face mask or something. That just suggests what it does to your skin. I’ve used it every night for a few weeks now and I really like it. It is a very thin gel, and one pump covers my face easily. I dries down after about a minute and I can put on my regular eye cream and moisturizer. My dark spots do seem to be fading, though that could just be that I’m spending less time in the sun. My skin does seem brighter and smoother, though, so I’ll definitely continue to use it! Finally, in my constant battle to diminish fine lines that cause my foundation to crease, I grabbed the Garnier Ultra-Lift Targeted Line Smoother. It feels kind of like a silicone-based primer, and it claims to have a natural, plant-based retinol ingredient. It smells faintly of plant–do you know what I mean? You sort of feel like you’re smelling a greenhouse, and not one full of flowers, but that moist, almost sour soil smell? It is very faint in this product, so faint that I don’t always notice it. But I wanted to mention it just in case you’re particularly sensitive to that scent. This is the type of product that is hard to review since it works slowly, but after a few weeks of using it, I don’t love it. The plan smell gets stronger and I will honestly probably toss it. I can ignore a smell if the product works well, but this one does not seem to be having any effect. I’ll try another wrinkle cream for those stubborn forehead and smile lines. Next, on to dry shampoos. Now I’ve actually bought dry shampoos at Marshall’s quite a bit–they typically have a great selection of Batiste dry shampoos, which I have enjoyed. This time, though, I decided to branch out (and they were out of Batiste) and I noticed the Bio Keratin Volumizing Dry Shampoos, which I’d never heard of before. They had a variety of scents, so I picked up a can in Citrus and one in Elegant. I’ve been trying a few different dry shampoos recently to see if the Living Proof Perfect Hair Day dry shampoo that keeps getting rave reviews is really worth the price. I tried the Bio Keratin dry shampoo in the morning two days after shampooing. I have really dry hair that takes about a day and a half to begin to feel oily. I’d planned to wear my hair up, which I often do on the last day before washing my hair again, and I use dry shampoo mostly for volume since it tends to leave my hair feeling a bit dry and dirty–you know, that tell-tale dry shampoo film. When I sprayed in this dry shampoo, however, not only did it not leave a white cast on my light brown hair, but it added volume and made my hair just look clean! It revived my curls from the day before so I didn’t have to do anything but tousle and go! I was so impressed I immediately bought another bottle. And then two more. Seriously I’ve been back to Marshall’s several times and I’ve practically bought out their whole stock. It worked just like I wanted the Living Proof dry shampoo to work, and actually adds MORE volume than the Living Proof, which I’ve also been trying. At the same price point, it works better than the Batiste, which often leaves my hair looking a little powdery. And that clean feeling lasted all day–even by night, it didn’t feel oily or greasy at all. I can’t find it anywhere else online, but if you see it at Marshall’s or T.J. Maxx, definitely pick up as many bottles as you can find. I also picked up a few Alba products. My husband loves their lotion–he loves anything that smells like coconut–and I adore their graphic tropical packaging. But these I’d never seen before. 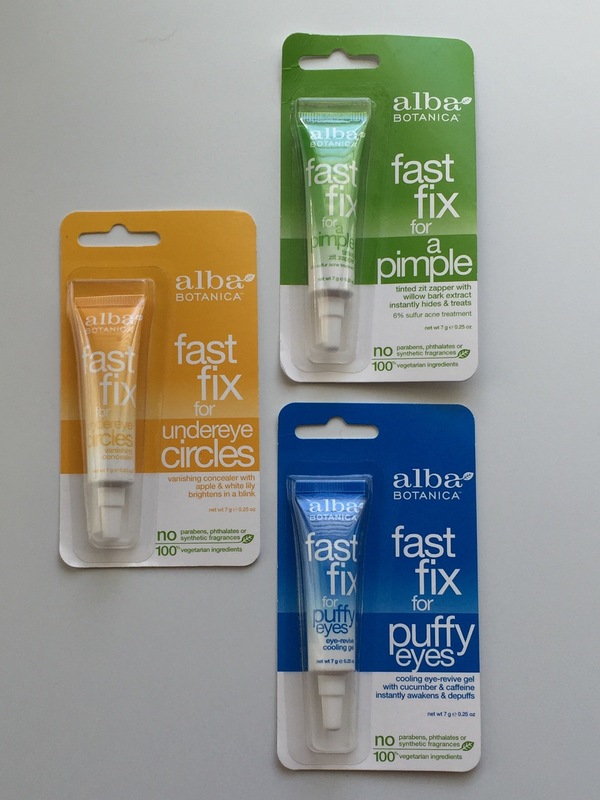 They seem to be a “Fast Fix” line–there is a product for puffy eyes, dark circles, and pimples. They were each about a dollar less at Marshall’s that they would have been at Target, and I like that they are typically vegan, all-natural, no sulfates or parabens, etc. The Fast Fix for Puffy Eyes really did de-puff, and I put it through the ringer. The first day I used it I’d had to sleep in my son’s bed the night before–he had a cold and kept waking up coughing all night long. I’d only gotten about four hours of sleep, and not four continuous hours. Add my terrible allergies to that and you can guess my eyes were crazy puffy the next morning. This worked really well–I used way too much so let me tell you, you really only need the tiniest dab, we’re talking a pinhead sized amount. Like one of those tiny bead-like sprinkles on fancy baked goods. It is not cooling unless you keep it in the fridge, but it works well either way. I still prefer my Garnier Eye Roller, as the metal ball roller-thingy (technical terms) is much cooler and easier to apply than this gel, but this is another great option. The Fast Fix for Undereye Circles really didn’t do much. It is basically a thin yellow color-corrector, but it is so thin that it blends away to nothing, and the Garnier BB eye roller that I bought in this same haul worked much better for correcting undereye darkness. So this is a quick review, but there’s just not much to say–not my favorite. What intrigued me about the Fast Fix for a Pimple was its ingredients–it does not contain salicylic acid or benzoyl peroxide (which will bleach your pillowcases if you wear it to bed, fyi–learned that the hard way) that are the most common ingredients in drugstore acne treatments. Instead, the active ingredient in this cream is willow bark and sulfur. And even though I read the label, somehow I’d missed that it was tinted! Awesome! I realize tinted zit treatments are nothing new, yet for some reason I’m always so impressed that someone thought to combine these products. It blends well, may need some building for a darker pimple, but overall seems to be a good product. And it did help to quickly clear up my minor breakouts. It would be great to take along with you during the day for touch-ups with some added skincare benefits. All in all, the Alba products were good. Not life-changing, but good, solid products. If you already have something that works for you in these categories, there is no need to switch. But if you’re looking for an affordable item to de-puff, zap zits, or color-correct dark circles, these could work for you. I am always looking for a good hand lotion. As anyone who lives with children knows, constant hand washing is a must. Between soap and hand sanitizer, my skin, cuticles, and nails are almost hopelessly dry. I also am trying to use more cruelty-free and natural products when possible, so I grabbed this Earth Therapeutics Intensive Hand Repair with Aloe and Cocoa Butter. The lotion has a beautiful pearly sheen, and I swear it makes my hands look luminous–not unnaturally so, just a little brighter, younger, less dehydrated. It soaks in quickly and provides long-lasting moisture. I’m trying to remember to moisturize my hands every time I wash them, so I’ll keep this in my (increasingly heavy) bag to remind myself of that goal! 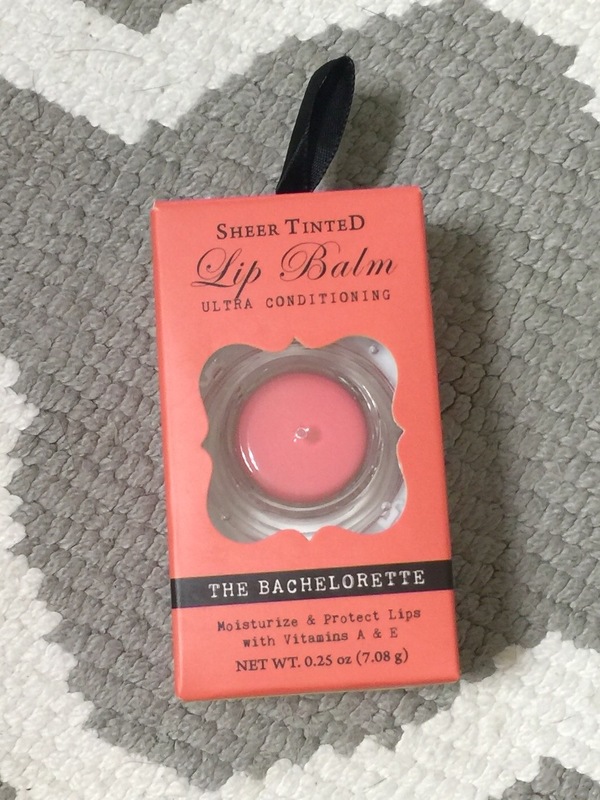 The most makeup-like item I picked up was a lip balm pot by Doxen & Hue in the shade Bachelorette. I couldn’t resist the adorable packaging! I’m not usually a huge fan of potted lip products, but this one is a gorgeous light peachy pink and it is just beautiful on the lips. The color is more like a sheer lipstick than a balm–it has uniform coverage and is not too glossy. And like a good lip balm should, it actually moisturizes! I know that sounds like a crazy thing to praise–it is a lip balm after all–but so many products that claim to moisturize my lips actually dry them out! Those cute little EOS lip balms are the worst. I keep picking them up in the store but every time I use them, I feel like they’ve slipped off of my lips within an hour and left my lips drier than they were before. Not only did this lip balm provide continuous moisture (wow I sound like a makeup ad right now!) but even after the balm sank in, the color remained behind like a lip stain! So this lip balm is a definite score–I wish I’d grabbed the other color as well! Final Word: Overall, I’d say this was a remarkably successful discount beauty haul. All of the products performed well and I will continue to use them. The ones that really blew me away, though, were the Garnier eye roller, the Bio Keratin dry shampoo, the Earth Therapeutics hand lotion, and the Doxen & Hue lip balm. I am now hooked on Marshall’s beauty aisle. What great items have you found at Marshall’s lately?